Yesterday Brazilian President Dilma Rousseff sympathized with the major protests that shook Brazil on Monday night, but stopped short of any immediate policy solutions to demonstrators’ general demands. At the end of a speech yesterday in which she unveiled reforms to Brazil’s 46-year-old mining law, Rousseff addressed the events of the night before. Rousseff said she was “proud” that so many Brazilians took to the streets to defend their rights, and that the country “awoke stronger” that morning. The president also praised the “peaceful nature” of the protests, though she condemned isolated acts of violence, according to O Globo. But agreeing with the message of protests is one thing, and making concessions is something else. While the AP reports that officials in five major cities announced plans to lower bus fares, and São Paulo Mayor Fernando Haddad met with protesters to discuss a cut as well, the protests have moved on from this issue. So far the administration has refrained from offering any new policies to combat corruption or improve transparency in public spending, which have become the demonstrators’ (loosely expressed) demands. Meanwhile, demonstrations continued in Rio de Janeiro and São Paulo last night. Folha d. São Paulo reports that some 50,000 gathered in the latter city last night to resume protests, with much more looting and vandalism of shops and banks occurring than on Monday’s event. In response to the continued demonstrations, the Ministry of Justice has announced it will deploy the National Public Security Force (FNSP) to five major cities throughout the country, each of which is currently hosting football matches in the Confederations Cup, which is seen by many as a rehearsal for the World Cup. The only city hosting a Confederations Cup match which did not request the special police force was Recife, according to the BBC. The heavy-handed nature of the police response to the protests in Brazil -- which has been condemned by local rights groups -- has become more apparent in recent days. 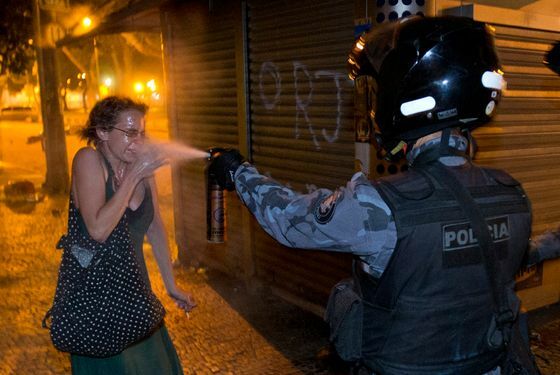 The AP has some astonishing images of the demonstrations, including this photo of a woman getting pepper sprayed in the face at close range in Rio de Janeiro, which has gone viral. Rio’s G1 also has a video of police apparently firing pistols directly into a crowd last night. A Peruvian court has ordered the government to suspend a controversial mandatory military draft one day before it was set to go into effect. According to El Comercio, President Ollanta Humala has said he will respect the ruling, although he disagreed with the characterization of the draft as discriminatory. According to Humala, the current volunteer army is more discriminatory as the majority of volunteers come from poor families. “With this decision, we are condemning only the poorest to do military service,” he said. As peace talks between Colombia’s FARC rebels and the government progress in Havana, Cuba, former Colombian Inspector General Jaime Bernal has called on President Jose Manuel Santos to engage the smaller ELN guerrilla group, Semana reports. Santos has said he is willing to negotiate with the ELN, but only if they declare an end to hostilities first. The United States Department of State has issued a statement expressing concern over the Ecuadorean National Assembly’s recent passage of a new media law. While proponents say the law will create a more pluralist media atmosphere, the U.S. government joins critics in claiming that it may restrict freedom of press and encourage media outlets to engage in self-censorship. Central American Politics looks at a recent Gallup-CID poll which found that nearly half of Guatemalans (51 percent) and Nicaraguans (50 percent) believe their governments control the national media. By contrast, this opinion was held by only 32 percent of Salvadorans, 38 percent of Panamanians, 29 percent of Costa Ricans, and 35 percent of Dominicans. Chile’s Supreme Court has approved the extradition of former Argentine judge Otilio Romano, accused of having a hand in forced disappearances, torture and illegal raids while serving as a state prosecutor during the country’s military dictatorship. The Commission for Human Rights and Minorities in Brazil's lower house of Congress has approved legislation that would allow psychologists to treat homosexuality as a disorder or illness, a measure that was fiercely opposed by gay rights activists in the country. It will now be debated in other committees before it is voted on in the full Chamber of Deputies.